A task step can be configured to execute a command or tool on the Actions tab in the Task Designer pane. The step must be selected in the Tasks pane for the Actions tab to be available in the Task Designer pane. To configure a step to run a command or geoprocessing tool, click the Record button or the Edit button on the command action bar. Load a command by clicking the Record or Edit button. Click the Record button and click a command to quickly load it as the active command for the step. You can click commands or tools on the ArcGIS Pro ribbon or in the Catalog pane, or right-click to access commands. Click the Edit button to browse to or search for a command or geoprocessing tool. To configure a step to run your own Python script tool, click the Record button and double-click the tool in the Catalog pane to load it as the active command for the step. Make sure the script tool exists in a toolbox that has been added to the project. You can also browse to the custom script tool by clicking the Edit button . The quickest way to create a series of task steps with commands is to record steps. Command or tool clicks can be recorded to create steps that are configured with the command or tool that was clicked. During a recording session, each command or tool clicked creates a new step in the Tasks pane. Some commands can be embedded in the Tasks pane when the step runs. For example, the Attributes command and Create command panes are embeddable. Embeddable commands are embedded by default. When the step runs, an embedded command opens and displays in the Tasks pane instead of in a separate pane. The step behavior of embedded commands can be set to Auto Run only. Some embeddable commands support preset parameters. Preset parameters become available in the Task Designer pane under Command/Geoprocessing when the command is embedded. To view the embeddable command properties in the Task Designer pane, click the Edit button on the command action bar. Preset parameters are only available in the Task Designer pane and are not available when the step runs. For example, when embedding the Create command , the preset parameters Filter and Group By are available. These parameters can be preset to control how the feature list is displayed in the embedded Create Features window when the step runs. When a geoprocessing tool is loaded as the step tool, it is embedded by default. 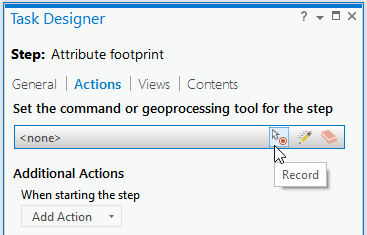 When the step runs, an embedded geoprocessing tool opens and displays in the Tasks pane instead of in the separate Geoprocessing pane. When a geoprocessing tool is loaded and embedded, the tool parameters display in the Task Designer pane under Command/Geoprocessing. To view the embeddable tool properties in the Task Designer pane, click the Edit button in the command action bar. Geoprocessing tool parameters can be left empty, which requires the task user to populate them when the step runs, or the task author can populate them with preset values. If the tool parameters are populated with preset values, the step can automatically run the tool without requiring input from the task user. For example, the step behavior can be set to Automatic, where the step automatically starts, runs the geoprocessing tool, and proceeds to the next step. A step can load a dialog box prompting the user to enter an attribute. The entered attributes can be saved in variables to be used in subsequent steps. For example, a step would get an attribute from a task user and use it to calculate attribute fields in a subsequent step. With the step selected and the Task Designer pane open, click the Actions tab. To load a command or tool, click the Record button on the command action bar and click a command or tool on the ArcGIS Pro ribbon or in the Catalog pane, or right-click to access commands. Click the Edit button on the command action bar to edit the properties of the tool or command. Click the drop-down list under Type of Command and choose either Command or Geoprocessing Tool. For Command, locate the command you want to use. Choose List of Tabs to find the command by its tabbed location on the ribbon, or choose All Commands to search for the command by typing the command name. For Geoprocessing Tool, locate the tool you want to use. You can search for a geoprocessing tool by typing the tool name. To configure a step to get attributes, click the Edit button on the command action bar and choose Get Attributes under Type of Command. Click Add Attribute to define an attribute to be entered by the task user.